President-elect Abraham Lincoln arrived at Buffalo’s Exchange Street Station on the evening of Saturday, February 16, 1861, while journeying to Washington for his inauguration. Today the site is occupied by a modern Amtrak station. Lincoln was met by former President Millard Fillmore and an enormous, enthusiastic crowd. By some estimates, 75,000 citizens swarmed downtown Buffalo to get a glimpse of the new president. After making his way through the crowds to the American Hotel, Mr. Lincoln appeared on the balcony and was welcomed by the acting chief magistrate. The site of the American Hotel is now occupied by the Main Place Mall. Readers may be interested to know what he said to Buffalo on that day: “MR. MAYOR AND FELLOW CITIZENS:—I am here to thank you briefly for this grand reception given to me not personally, but as the representative of our great and beloved country. Your worthy Mayor has been pleased to mention in his address to me, the fortunate and agreeable journey which I have had from home—only it is rather a circuitous route to the Federal Capitol. I am very happy that he was enabled, in truth, to congratulate myself and company on that fact. It is true, we have had nothing thus far to mar the pleasure of the trip. We have not been met alone by those who assisted in giving the election to me; I say not alone, but by the whole population of the country through which we have passed. This is as it should be. Had the election fallen to any other of the distinguished candidates instead of myself, under the peculiar circumstances, to say the least, it would have been proper for all citizens to have greeted him as you now greet me. It is an evidence of the devotion of the whole people to the Constitution, the Union, and the perpetuity of the liberties of this country. I am unwilling, on any occasion, that I should be so meanly thought of as to have it supposed for a moment that these demonstrations are tendered to me personally. They are tendered to the country, to the institutions of the country, and to the perpetuity of the liberties of the country for which these institutions were made and created. Your worthy mayor has thought fit to express the hope that I may be able to relieve the country from the present, or, I should say, the threatened difficulties. I am sure I bring a heart true to the work. For the ability to perform it, I trust in that Supreme Being who has never forsaken this favored land, through the instrumentality of this great and intelligent people. Without that assistance I should surely fail; with it I cannot fail. When we speak of the threatened difficulties to the country, it is natural that it should be expected that something should be said by myself with regard to particular measures. Upon more mature reflection, however, I think,—and others will agree with me—that, when it is considered that these difficulties are without precedent, and never have been acted upon by any individual situated as I am, it is most proper that I should wait and see the developments, and get all the light possible, so that, when I do speak authoritatively, I may be as near right as possible. When I shall speak authoritatively, I hope to say nothing inconsistent with the Constitution, the Union, the rights of all the States, of each State, and of each section of the country, and not to disappoint the reasonable expectations of those who have confided to me their votes. Life of Abraham Lincoln, Sixteenth President of the United States: Containing His Early History and Political Career; Together with the Speeches, Messages, Proclamations and Other Official Documents Illustrative of His Eventful Administration, pp. 75-77. Philadelphia, PA: J.E. Potter, 1865. Crosby’s book is online in full text at Google Books. Paragraphs were added for the purpose of this article. *This article was featured in The Buffalo History Museum‘s Spring 2015 issue of The Album. ** For more Lincoln love join the Buffalo Civil War Roundtable as they celebrate President Lincoln’s Birthday. There will be a short program and a Lincoln orator. Join uniformed re-enactors as they perform a rifle salute on the Portico. Local authors will be present and there will also be activities for the whole family. Sunday, February 14, 2016 from 12-2pm. FREE. More info at buffalohistory.org. Julius E. Francis came to Buffalo in 1835 from Connecticut and ran a successful drug store business for nearly 35 years, mostly at 268 Main Street. The photo above is of his store at 16 South Division St. Beginning in 1865, with the assassination of President Abraham Lincoln, Francis became absorbed in preserving and promoting the martyred President’s memory. He collected much Civil War and Lincoln memorabilia, but determined that there must be a national observance of Lincoln’s birthday, February 12. A bachelor, he declared that this cause was “my wife and my life.” At his own expense, Francis held the first of seven annual observances of Lincoln’s birthday. Each year until his death in 1881, he rented a hall, arranged the speakers, poets, music, essayists, and invited the public to attend free of charge and honor Abraham Lincoln. His two attempts to persuade Congress to establish a national Lincoln’s Birthday holiday failed and he died in 1881, having founded the Buffalo Lincoln’s Birthday Association which continued the work. In his will, he made the Association heirs to his house and lot at 145 East Eagle Street, and six $1,000 bonds. In 1901, the Association contracted with New York sculptor, Charles H. Niehaus, to create a statue of Lincoln that would grace the new Buffalo Historical Society in September, 1902. Their Francis legacy had grown to $10,000 ($221,556 in 2005 dollars), of which they spent $6,000 for the 1,200 pound bronze statue. At least one copy of this statue exists, in a park in Kenosha, Wisconsin. The chair is a copy of Lincoln’s “chair of state,” stored at the Smithsonian. 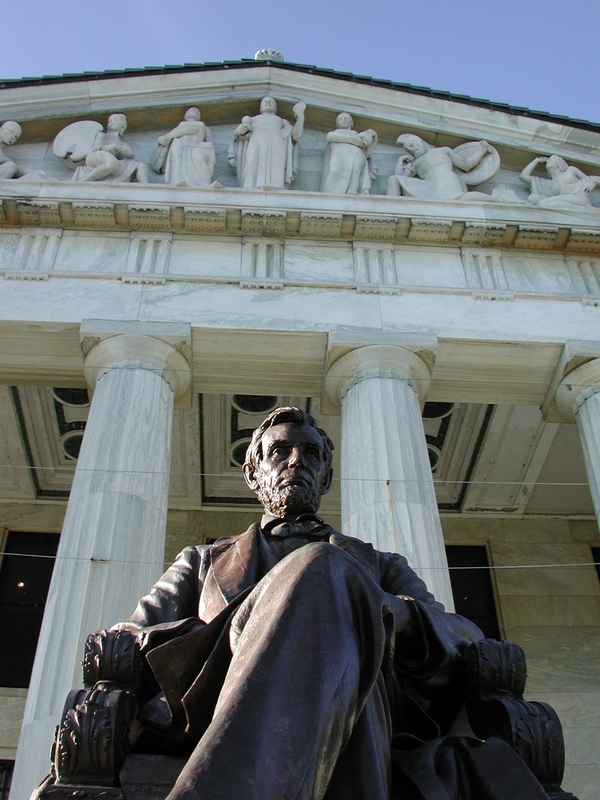 The original location of the statue was in a portion of the new Buffalo History Museum building named, “The Lincoln Room.” That room also contained the Francis Lincoln memorabilia collection. In the early 1930’s, the statue was moved outdoors in front of the South Portico of The Buffalo History Museum, where is remains today. Lincoln’s Birthday was never designated as a national holiday (unlike George Washington’s), but was approved as a legal holiday in a number of states. Today, most people assume incorrectly that President’s Day nationally honors both Washington and Lincoln. 2006 is the 132nd year during which observances have been made in Buffalo for Lincoln’s birthday. The ceremonies are carried on in Julius Francis’ memory, also, for having the passion and the vision to celebrate one of the greatest American Presidents. Join us this Sunday, February 15th for President Lincoln’s Birthday Celebration!